I'm writing out my final report on the consulting project and reflecting on the incredible experience I've had over the past few months. The preservation association deserves credit for recognizing the need to archive this important collection for future access and research. I've been impressed to see how large the collection turned out to be and the variety of media that are presented among its records. The collection contains numerous opportunities for research, exhibits, and other projects that will support the work of the association. Even though I've now worked in public history related positions for over five years, this project has demonstrated an even greater link between archives and outreach. The processing of this collection has revealed so many intriguing stories of events and people which contextualizes the historical significant of the Hamilton Willard Shafer Farm. I'm looking forward to presenting some of my favorite finds in an exhibit walk at the end of the month. I also appreciate the opportunity to understand how to apply information governance principles spanning the entire records spectrum to a smaller, non-profit environment. This experience has demonstrated the need to set realistic goals and milestones. However, I've also learned that these goals are scalable and can be achieved through various means at various levels to ensure that information assets are safe, preserved, and accessible. Throughout the past few months, I've worked with documents and objects that are over a century old and I've also processed digital records that are barely a year old. Each class of information asset has presented its own challenge, but this project has also shown me the interrelations between them and how collectively they support the organization. Managing this project and ensuring that all of the outcomes were met has been challenging but highly rewarding. Thank you for following this blog and the progress that we've made with the Shafer/Motherway Collection! An important component of my project outside of the Shafer/Motherway project was to develop a plan for properly archiving the born-digital records that are being created now as the Burkittsville Preservation Association carries on their day-to-day activities. These records include administrative groups such as the association's official minutes as well as a growing photograph collection documenting progress and activities at the Hamilton Willard Shafer Farm. At the present, the born digital records total 2 GB of files, predominantly JPG image files. There are also a few video files that are stored among the various photographs. In analyzing this data, I found that the file formats are mostly consistent and are recent enough that their native format is also in conformity with recommended preservation formats. Some of the photograph files are also stored in RAW format which could be migrated to an archival TIFF quality file. I am recommending that the organization adopt the use of a Google Drive to store these records. Since these records are in an active use stage and need to be accessed on a regular basis, the use of a Google Drive to which access can be given in varying levels will fulfill the needs of the association. The drive also provides a central records storage place that each member of the association can access to upload their files. This will prevent the current activity of storing them on individual cameras, computers, or flash drives. I also recommended creating a backup of these files on an external hard drive that will be stored with the archival collections. A secondary backup would also be advisable and stored in a different geographic location. The association can utilize Google Drive at this stage because the records they are creating do not pose any serious security risks. Future planning should consider the purchase of a physical or cloud server space where a preservation program could be used to scan all of the files, generate fixities, and perform regular checks for the integrity of the records. In reviewing these materials, I found images that reflect the progress that we've made throughout the past 4 months. 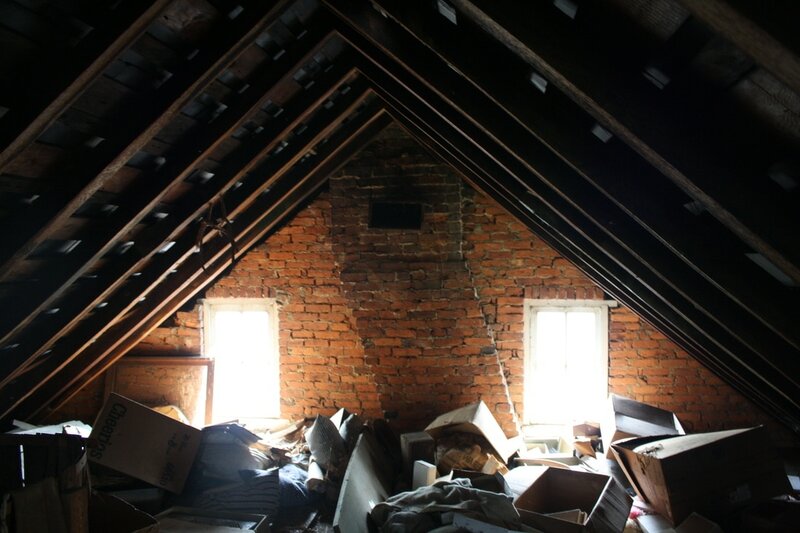 For instance, the below image of the attic shows the "before" scene. Many of the items that became a part of our archival Shafer/Motherway Collection were recovered from this space! Throughout this project, I have gained a clearer understanding not only of the Shafer/Motherway Collection itself, but the role these collections can play in supporting the mission of the Burkittsville Preservation Association. Becoming familiar with these records and the story that they tell, I understand how this collection will provide reference for the ongoing preservation of the property and its historical interpretation for future visitors to the site. 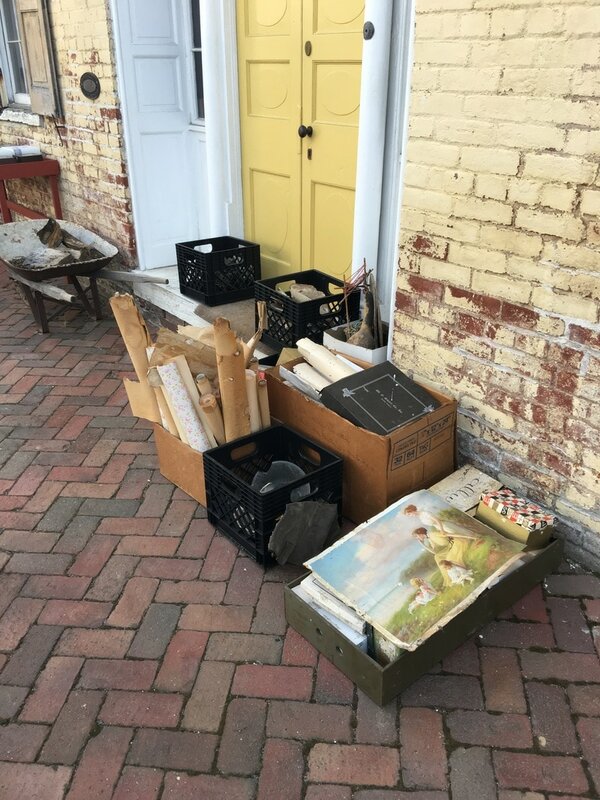 As an organization dedicated to preserving the material culture of Burkittsville, the association's collections will be vital tools for contextualizing the historic properties that they preserve. All of this context builds a stronger case for the allocation of resources to capital preservation projects as well as ongoing heritage tourism efforts that can help to boost the local economy and further integrate the association into the community. Reproduced family portraits and photographs on display at the Hamilton Willard Shafer House. As the property is preserved and becomes safer and more secure, the collection will provide a variety of opportunities for exhibits to narrate the history of the property and the people who lived there for over 150 years. Since the collection encompasses so many medias of information, there are many different approaches to exhibits that are possible for the site, from traditional historical displays to art-themed gallery exhibits. The collection will also give the preservation association the ability to facilitate its own research as well as that of other scholars. This opportunity gives the preservation association another way to reach its mission of facilitating the study of Burkittsville's unique and significant history. In a sense, the recovery of the Shafer/Motherway Collection is serendipitous for the association. When the organization acquired the property last year, the initial focus on preserving the historic house and farmstead was a driving force for the association. Now, with the addition of the collection from the house, the association can tap into more programing opportunities that will draw in new audiences to this historic and important place. With the processing of the manuscripts record group now finished, I have also wrapped up the initial finding aid for the collection. The metadata for this collection guide is the result of the past three months' work of inventorying and describing the collection as it grew from a few recovered objects to a larger, more formal historical collection. I utilized tags from DACS (describing archives: a content standard) and Dublin Core Metadata Standard to describe the overall collection in the finding aid. While the present form of the finding aid is as a searchable PDF, the document could easily be transformed into EAD (encoded archival description) for web presentation in the future if the association procures the necessary equipment to support this kind of finding aid. In the meantime, the finding aid now provides a comprehensive introduction to the overall collection with the most emphasis being given to the manuscripts group, which is described further in the attached container list. *The date range does not include undated objects which may pre-date 1869. The date range provided in this finding aid most accurately describes the manuscript group. 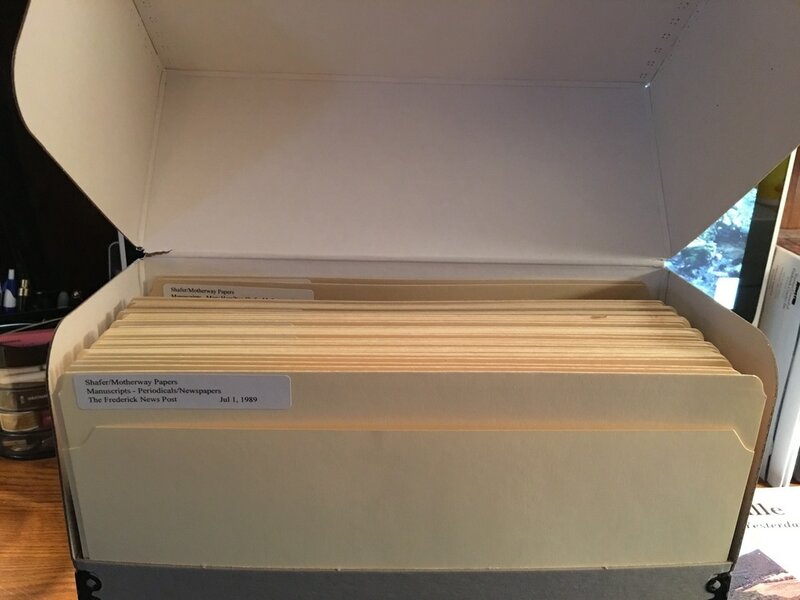 The Shafer/Motherway Collection incorporates the personal and professional records of two generations of the Shafer family in Burkittsville, Maryland. The collection provides strong research potential in rural business and agriculture, women’s advancement in professional careers in the early-20th century, and the life of a farming family during the Great Depression. Beginning with the acquisition of the property in the fall of 2016, the collection has been recovered from the Hamilton Willard Shafer house and farm as the structures are cleaned out to prepare for significant preservation and restoration projects. In addition to its research value, the collection will support the interpretive design for the Hamilton Willard Shafer house and farm as the site is further developed to welcome visitors to the Crampton’s Gap Historic District. There are three main groups in the Shafer/Motherway Collection: Manuscripts, Objects, and Textiles/Apparel. The collection as a whole documents the life of the Shafer and later Motherway families who resided at the Hamilton Willard Shafer house and farm from the last-quarter of the 19th century until the turn of the 21st century. 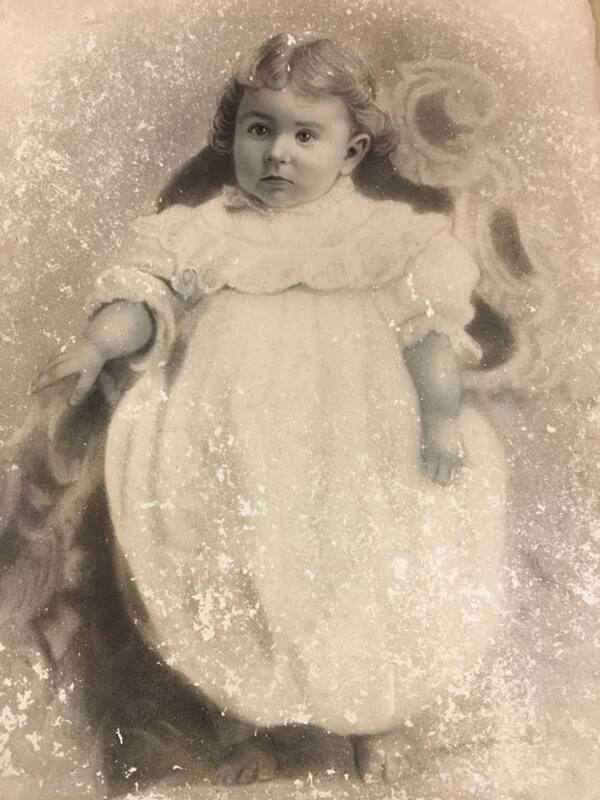 While the bulk of the collection details the life of Mary Hamilton Shafer Motherway (1900-2004), other members of the family are also represented, including Nora Margaret Shafer (1896-1963), Dr. Ralph Alexis Shafer (1890-1964), Hamilton Willard Shafer (1860-1919), and Sarah Margaret Arnold Shafer (1858-1939). The Manuscripts Group contains all documentary (bound and unbound) records in the collection, ranging in date from 1869 to 1995. There are six series in the group: Books, Periodicals/Newspapers, Prints/Artwork, Sheet Music, Hamilton Willard Shafer Papers, and Mary Hamilton Shafer Motherway Papers. The latter is further divided into four subseries: Correspondence, Financial Records, Personal Records, and Professional Records. With the exception of the Personal Records subseries of the Mary Hamilton Shafer Motherway papers, all of the group’s series and subseries are arranged chronologically within their respective sections. The Objects Group contains all three-dimensional objects including those comprised of metals, wood, glass, and other natural and man-made materials. The Objects Group has been inventoried but will undergo further processing before becoming available for research purposes. The Textiles/Apparel Group contains all objects made of fabrics, including household items such as sheets, table cloths, and other decorative scarves and clothing. The Textiles/Apparel Group has been inventoried but will undergo further processing before becoming available for research purposes. It’s beginning to look a lot like an Archive! In my last post, I discussed some of the decisions that we are making in regards to the immediate steps we will take in preserving the Shafer/Motherway Collection. Many of these decisions are predicated on the resources that are available at the present to address the most critical needs for the collection. In reviewing the variety of documents, objects, textiles, and more that this diverse collection contains, I decided to immediately rehouse the manuscripts group with the available resources. ​Before rehousing the manuscripts section into acid-free folders and boxes, I stored them in temporary folders while I cleaned particles of dust and dirt off of them and allowed them to acclimate to their new temporary environment in our records storage room. Most of the collection is now rehoused in standard file folders and document cases, but the larger bound books, many of which are in fairly deteriorated states of condition, were placed in clamshell boxes that will allow for them to lay flat. This will also allow them to be viewed without removing them from their boxes during handling, which should also help to protect them from further damage. One of the 1869 bound encyclopedias, the oldest of the documents in the Manuscripts Group, seen in its opened clam shell box. ​With the rehousing of the manuscripts group finished, I will finish the finding aid by creating the scope and content statement and descriptive guide to join the container list. Upon completion, the manuscripts group processing will conclude and the collection will be accessible. In my last post, I discussed the completion of the inventory component of our accession of the Shafer/Motherway Collection. The numbers reported in that blog included details on the size and scope of the collection. However, there are numbers that can be gleaned from the results of the inventory: the cost of completing the processing of the collection and providing for its continued preservation. There are many economic factors that contribute to successfully archiving a collection. Physical site expenses such as shelving, boxes and folders, and climate control contribute to the preservation of the collection while database software and web development costs are necessary to ensure accessibility. For any institution, these costs can be prohibitive or difficult to budget, but this is especially true for small, non-profit organizations. I have worked for the past six years in my local historical society and have experienced the challenges of balancing desired level of archival storage, preservation, and accessibility with the realities of volunteer workers, donation-based income, and limited resources. These experiences have demonstrated the need to prioritize your projects and to move forward with manageable goals. Long-range planning is often necessary to ensure that the goals you set are achieved in a manner than can be supported by annual funding plans or, in some cases, special fundraising efforts. For the Shafer/Motherway Collection, I am approaching the drafting of my recommendations by prioritizing those parts of the collection that are most in need of proper housing and storage. The manuscript collections are an easy first step which meets this goal since the documents themselves have been subjected to moisture and weather that have hastened their deterioration. However, fully processing these documents will also support greater access to this group of the collection and provide the association with a better impression of the records contained within this section. Looking forward, rehousing the most fragile or vulnerable objects and textiles/apparel will follow the processing of the manuscripts group. Developing a tool to grant digital access to the records will also be a priority in the next phases of archiving this significant collection. All of these goals will, of course, need to be aligned both with funding realities and with the programmatic goals of the organization. ​The first stage of my consulting project has now been finished with the completion of the accession inventory for the Shafer/Motherway Papers. This project has been the first full appraisal/acquisition that I’ve completed and the process has been very illuminating. Throughout the past three months, the collection has developed into an impressive archive that will not only be valuable to future research and scholarship, but will also support the activities of the preservation association in its restoration of the Hamilton Willard Shafer Farm. Overall, the collection incorporates three groups: Manuscripts, Objects, and Textiles/Apparel. The manuscripts group includes six series which follow the progression of the Shafer and Motherway Families over a period of over 150 years. The oldest documents in the collection date back to the American Civil War and the group is particularly strong in materials from the 1920s, the Great Depression, and the World War II eras. There are 169 folders of records in the manuscripts group, covering 4 linear feet. While this collection is small in the larger-scheme of things, it is double the size I originally assessed it to be. As the recovery process at the farm grew from 2-3 weeks to 2 months, I quickly realized that we would have a larger amount of material to work with. 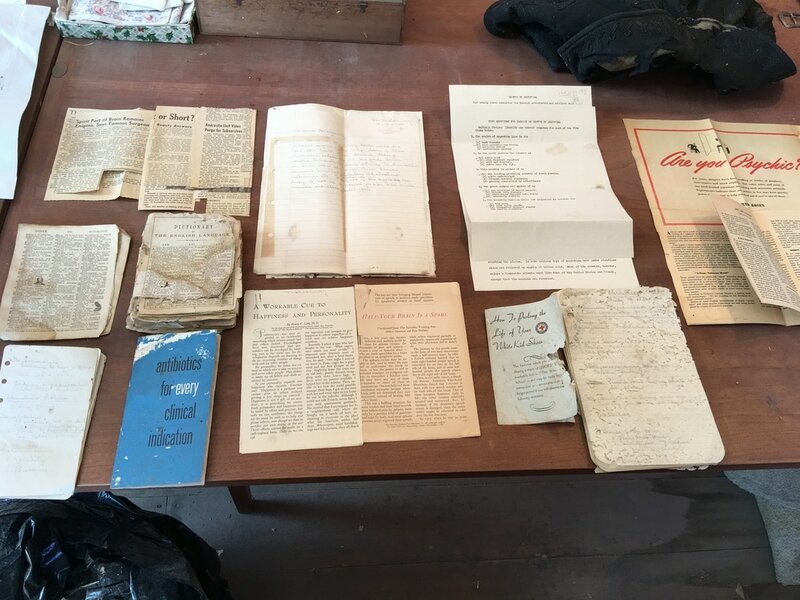 This inventory is essential not only for formalizing the accession of the collection to the Burkittsville Preservation Association, but it is also vital for planning the next steps of preserving the collection and making it accessible. Our next step in the process will be estimating the cost of supplies (boxes, folders, photo envelopes, interleaving, etc.) that will be needed to rehouse the collection. While inventorying the collection, I took measurements of every 3-dimensional object so that boxes or other housing can be procured to store them. Most of all, I’m excited to see how the collection has evolved from just a few records detailing the life of one member of the family to a multi-generational assortment of documents, objects, and textiles that provide exceptional context to the history of the Hamilton Willard Shafer farm and the Shafer Family who lived there for over a century and a half. All archivists know that the records they care for contain remarkable stories to be discovered. After all, this is one of the most alluring aspects of the profession. 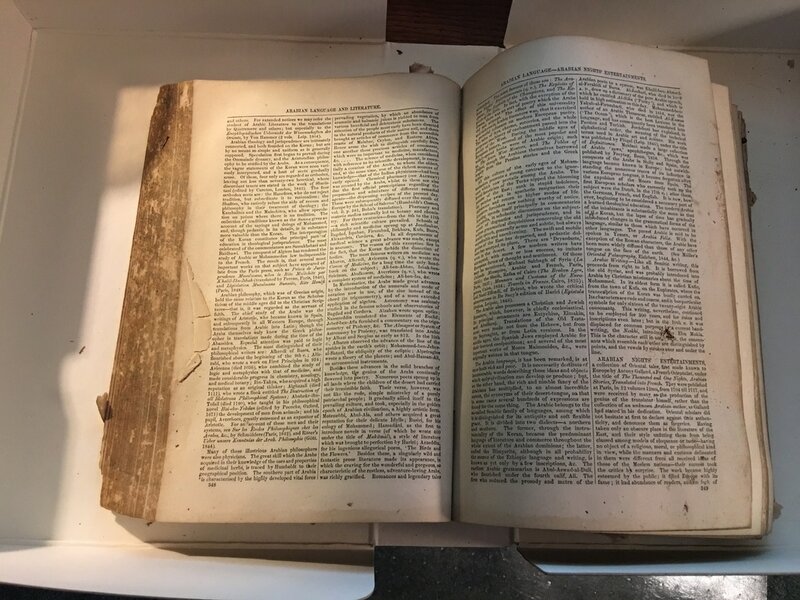 These stories make our collections valuable for research but they can also offer benefit to the organization that preserves them. Such is the case with a recent discovery in the records I’ve been processing in the Shafer/Motherway Collection. 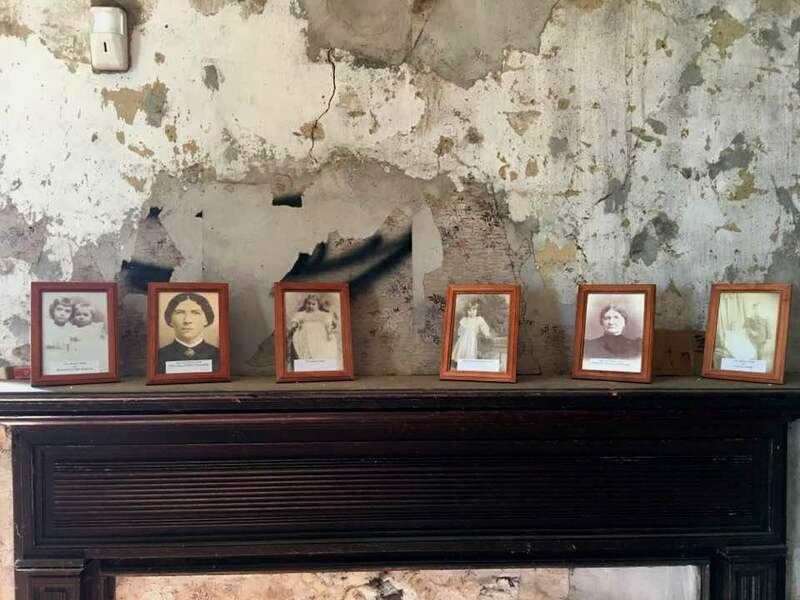 In brief, we know the general timeline of who lived in the house in the Hamilton Willard Shafer House which the Burkittsville Preservation Association is currently stabilizing and preparing to restore. The Shafer Family lived on the farm from the late-1880s until 2004. However, there are points in the timeline that are less clear than others and members of the family who's stories aren't as well documented as others. A recent discovery in the collection being archived from the Hamilton Willard Shafer House has helped to shed light on one of these family members and an important era in the timeline of the property. While some scholarship has devoted attention to Mary Hamilton Shafer Motherway, who resided at the house from the mid-1960s until her death in 2004, little is known about her sister, Nora. Born in 1896, Nora Margaret Shafer spent her entire life at the farm, living with her mother, Sarah Margaret Arnold Shafer (1858-1939). She lived through the sudden passing of her father and the loss of the family's primary source of income on the eve of the Great Depression. After Sarah’s death, Nora continued living in the house until her death in 1963. Through the preservation of the Shafer/Motherway Collection, more information about Nora's life is being uncovered and helping to fill-in the timeline of the property. Documents in the Financial Records Subseries of the Manuscripts Collection show that Mary, who was working as a nurse in the Public Health Service during the 1930s and 40s sent money back to Nora at the farm to help cover bills . The collection also includes objects sent to Nora from her brother, Ralph, who was a physician living in Winchester, Virginia during the Great Depression. The recovery of these stories demonstrates the research value that the Shafer/Motherway Collection provides. However, the collection is also proving its value to the preservation association, the organization that is overseeing its archiving. As work progresses to restore the Hamilton Willard Shafer House, these stories will be vital for interpreting the property for visitors. Understanding the lives of those who lived in the house provides an opportunity to attract visitors who will in the long-run support the activities of the preservation association. Archive collections not only provide value for intellectual activity, they can also be invaluable tools for supporting local cultural and economic activity. Family photographs on display at the Hamilton Willard Shafer House help introduce visitors to the family that inhabited the house and farm for over a century. 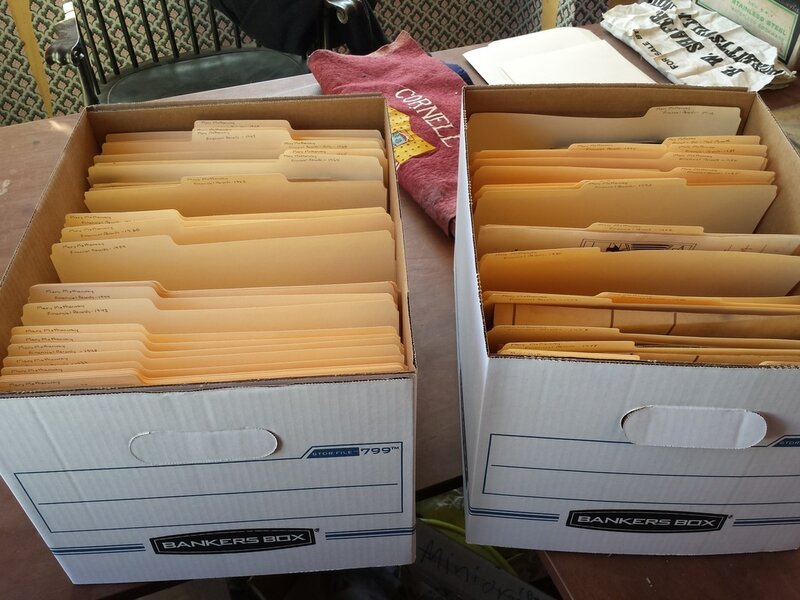 ​With the last batch of artifacts delivered to the records storage facility for the Shafer/Motherway Collection, I have met the initial goal of my project, completing the inventory in preparation for appraisal and accession. Since this collection is being constructed with little to no input from its creators, this inventory phase has been crucial to understanding the materials and also planning for their preservation. ​Last weekend, I spent a few hours sorting documents which we recovered from the attic of the house. Interesting discoveries continue to abound, including lecture notes and exams from Mary Shafer Motherway’s years as a medical student. An important realization brought about by these documents is that Mary continued her education even after she received her initial Registered Nurse License and moved to Panama with her husband, James, to work in the Canal Zone. 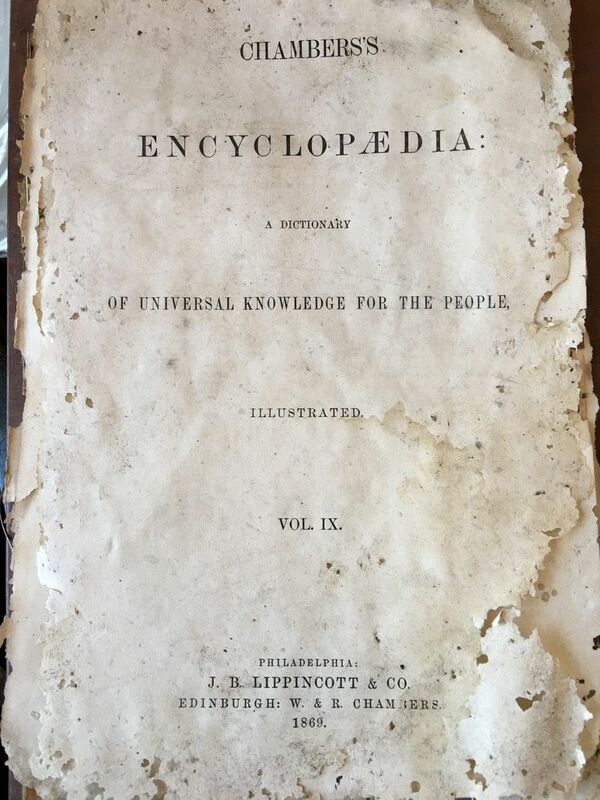 Another important discovery was the title page fragment of an encyclopedia, published in Philadelphia in 1869. We have recovered four volumes of this encyclopedia from various points in the house, but none of them had title pages or publisher information. Now we are able to identify their age and origin, making them among the oldest manuscripts found in the house. As this phase reaches its conclusion, my next step in the project will involve making initial appraisal recommendations which will be reviewed by the association board and finalized. I will also be determining the supplies that will be needed to properly house the collection so that an estimate of cost can be provided to the association for review. The association has agreed to support appropriate housing for the collection (acid free boxes and folders, interleaving, and other supplies) as much as they possibly can, given current budgetary constraints. Title leaf showing the title, date, and publisher of the encyclopedia set recovered from the house. ​I look forward to also beginning the description of the collection and preparing a database that is DACS and EAD compliant for development of future reference tools. I will be using Microsoft Excel to store descriptive information since this is a widely-accepted tool that can be imported into most software programs that could be obtained in the future for storing this data. In the past two months, I’ve worked with the members of the Burkittsville Preservation Association to recover a collection of historical records and artifacts from the Hamilton Willard Shafer House. The process has been illuminative in many ways, not only considering the unique environment in which I’m working to process a collection, but also gaining the experience of essentially constructing a collection from scratch. When this project began, I had first impressions about the size of the collection I would be working with. Having toured the site and spoken with members who were actively working on clearing out the house, I assumed that at most we would find a dozen or so boxes of materials that would constitute the collection. Setting to work, I initially saw rooms full of debris and trash from years of vandalism, leading me to assume that little if anything of historical significance was left to be found. One delivery of artifacts recovered from the house in transit to the records storage facility. ​The recovery component of the project has now taken two months, leading me to change my timeline for the project but also indicating that this collection will be of a significant size. So far, we have transported about 35 boxes and containers of documents, small artifacts, and other ephemera to our records storage space. Given that the project has nearly increased 3-fold in this process, I’m also learning that my initial impressions about the structure of the collection, its intellectual arrangement, will need to be changed to more appropriately account for the full breadth of materials that we have saved. ​While we still have the final appraisal of the collection to accomplish, it is clear that the Shafer/Motherway Collection will be significant not only in its physical size, but also in the areas of content that it holds. The collection offers an extensive view of the families who lived and worked in the historic house. More specifically, in the case of Mary Shafer Motherway, it demonstrates the life of an intriguing person, a women who challenged the societal norms of her era to lead a successful professional career that took her to places around the United States and beyond. Jody Brumage is a graduate student in San Jose State University's Masters of Archives and Records Administration program. This project is fulfilling the MARA 295 course requirements for an Organizational Consultation Project.